Where is Love Our Neighborhood Day? What is Love Our Neighborhood Day? The event is NOT a street fair; there will be no vendors with the exception of food trucks and event swag. It’s part of an Open Streets Initiative, Oaklavia, produced by Walk Oakland Bike Oakland to encourage people to play, to move, to exercise on safe, auto-free streets. For just a few hours, participants come out and play, get to know local businesses, community resources and organizations throughout the route. This event is created by a core volunteer team of residents from Emeryville and Golden Gate neighbors, SPAGGIA (San Pablo Area Golden Gate Improvement Association), and community advocates from Actual Cafe / Victory Burger, PLACE for Sustainable Living, Revolights. When is Love Our Neighborhood Day? Between the hours of 9am and 4pm, auto traffic and street parking WILL NOT be allowed on the event route. However, through traffic is allowed on Stanford and Powell. For those who need access to and out of streets within the event route should use Stanford and Powell. What will I find on the route? 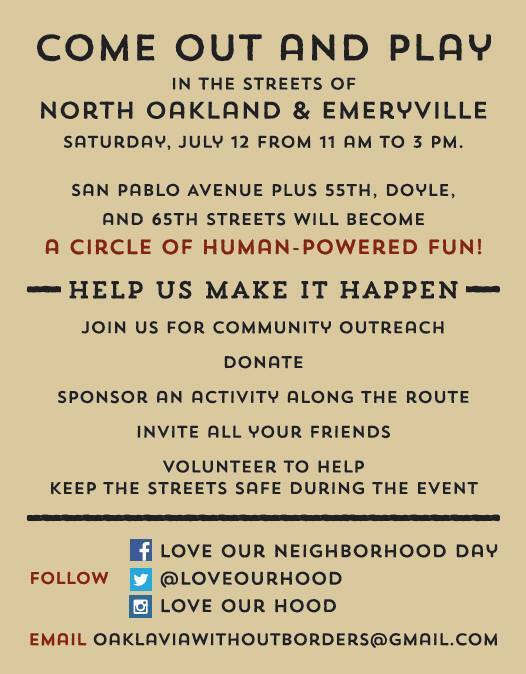 Click here to view the growing list of activities in the Love Our Neighborhood Day lineup. Who is supporting this event? Want to be involved? Join us using this form. 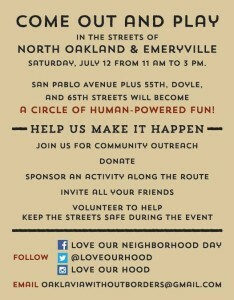 To make Love Our Neighborhood Day possible, organizers are soliciting sponsors in order to make the event fun and safe. Please consider contributing a meaningful amount to Love Our Neighborhood Day. All contributions are tax deductible. Click here to see what each level of sponsorship offers.